An invitation by Beth Whitman (Wanderlust and Lipstick), to guest post for her Wanderfood Wednesday series resulted in this post. On Wednesdays I’ll make a food related post mixing in the only bug NOT to be avoided — the travel one. In the post What the H*** Did You Do To My Quail? culinary discoveries made in China are discussed (along with childish questions about digging a hole to China). Some of the discoveries were ooohhhs and ahhhhs of palatable pleasures; others were unadulterated shrieks of horror. I was surprised to learn the ratio of noodles to rice consumed was fairly even. Once you’ve had the sublime, al dente noodles served in a fragrant broth, you’ll understand why rice has such a worthy carbohydrate competitor. While there are many variations, the general class of noodles is called La Mien. To see them “thrown”, a process whereby a huge chunk of the dough is twisted, pulled, whipped into the air like a circus act until the tiny strands magically separate and get tossed into a boiling pot of water with your name on it, was a highlight. My hands-down favorite dish was boiled octopus and squid with bamboo shoots and other vegetables in a fiery sauce — Shuizhu Yu. Very Sichuan! But octopus being not readily available here in the Great Plains, I experimented with another, slightly tamer dish — green beans. Not your ordinary green beans that grandmother extracts from a Kerr canning jar, I wanted to risk an arrest in Customs to bring a doggie bag back to the States. 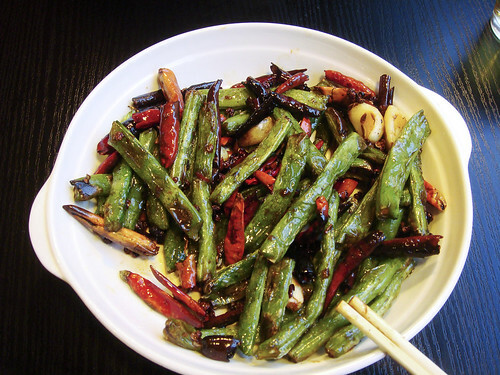 The Chinese name, Ganbian Sijidou translates to Szechuan Green Beans. As far as I’m concerned, anything with Szechuan in the name and garlic in the list of ingredients is worthy of a Customs delay. Check out the recipe below. RECIPE: fresh green beans, garlic, peppers (of any sort or heat), more garlic, garlic salt, sichuan peppercorns, sesame oil or hot chili sesame oil (if you dare). Heat wok until VERY hot. Add enough oil to pool a bit at the bottom. Then green beans. Stir fry until blistering but not overdone. Add the garlic, garlic salt, peppers, and peppercorns for a moment at the end. Enjoy! The sichuan peppercorns add a certain spiciness to the dish, but they’re not really hot. They do however produce a tingling sensation that is highly unusual, and fun. They make the dish what it is. Here’s where you can order them. Other unusual things ingested in China for which I’d NOT risk an arrest? Donkey Meat – very tasty; pan-fried Lotus flower — delicious and I regret terribly not taking a photo of it as it was a pinwheel paragon; boiled Pigeon — would die to avoid, mainly because of the gray, pallid color; and skewered Lamb intestines cooked over a spit. My son and I were heros that day with the locals. We only discovered later why they were approvingly bobbing their heads. information in such a perfect manner of writing? I’ve a presentation next week, and I am at the search for such information. Alex, I had leftovers for breakfast today! Jen, I’m glad to know this about you! Not many people claim to be spicy enthusiasts. Well, they claim to be…. Dang…it’s only breakfast time here, but I’d go for a dish of those beans right now. i love any kind of green beans – these look fantastic! Love it Sichuan! I can eat hot, spicy food all the day long! I’m a spicy girl! !